Home » Deals » 2018 Full River Olympic Express for 2 Plus Camping! 2018 Full River Olympic Express for 2 Plus Camping! The Full River Olympic Express Whitewater Adventure is a new experience at Adventures Unlimited that everyone must try! This 10 mile trip includes both the Upper Ocoee River and the Classic Middle Ocoee trip separated by a calm “lazy river” float. This gives you an adventure complete with the whitewater excitement of the 1996 Olympic section. This trip is suitable for all experience levels and perfect for those looking for a complete day of adventure – Ocoee Style. Grab a front row seat on our EXPRESS OLYMPIC TRIP TODAY! •BUY TODAY FOR $130 ($192 value) for the Full River Olympic Express trip and camping for two! After your trip, head on back to camp and enjoy a night under the stars! Get outside with Adventures Unlimited in 2018. Get Ready to Get Wet!! Head out to East Tennessee’s beautiful Ocoee River, where you’ll join a crew of likeminded explorers in our 14′ whitewater boats. Your all day adventure will take you through pounding Class III and IV whitewater full of haystack waves, thrilling holes and even a few calm spots all while under the expert eye of a well-trained guide. •	Adventures Unlimited's cancellation/re-scheduling policy applies to all reservations. •	Deal purchase becomes nonrefundable 30 days after purchase. •	Deal does not include taxes and fees. 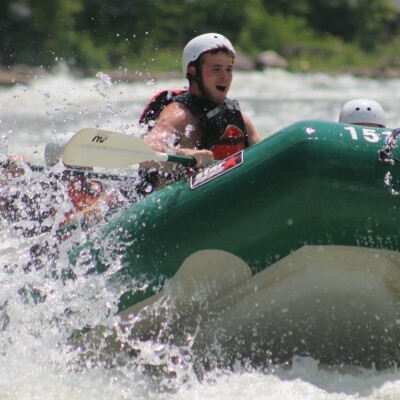 •	Must be 12 years of age or older to raft the Ocoee River. •	Valid only for service offered. •	Cannot be combined with any other offer or promotion.